White Flint / Pike District is great. But walking in it could be so much better. 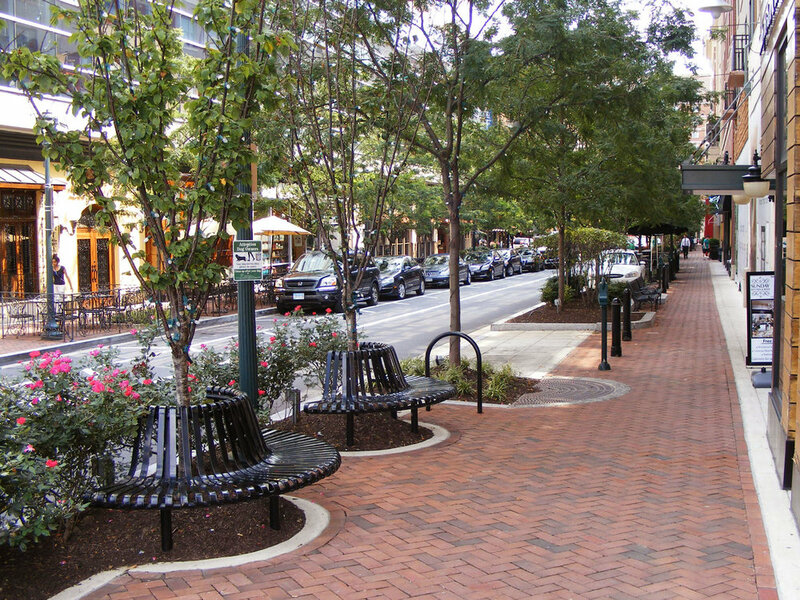 Making it possible, even pleasurable, for people to walk to the office or farmers market or happy hour is the essential essence of a successful smart growth community like the Pike District, the area surrounding White Flint Metro station in North Bethesda, Maryland. The good news is, we don’t have to wait for WMATA to finish SafeTrack, or bus rapid transit to be built, to create a more walker friendly White Flint. Many of the measures needed to make a community more walkable are the proverbial low-hanging fruit; Montgomery County and the state of Maryland can craft a walkable Pike District for surprisingly little money. Below, no pun intended, are the steps the Pike District can take to improve walkability. Seven are relatively quick and easy, four require some money and leadership, and a couple need to wait until more development is completed and Route 355 is redesigned into a grand boulevard. These small-scale, inexpensive improvements could make walking in the Pike District safer, smarter, and more enjoyable today! More lighting for sidewalks and crosswalks, clearly-visible crosswalks, and trimming trees and vegetation on drivers’ sight lines, will all make it easier for people driving to see people walking. When crosswalks are missing from one or more sides of an intersection, it forces people walking to go out of their way to cross in the existing crosswalks. In reality, many people walking continue to use the most direct route to cross the intersection, only without the safety of a marked crosswalk and walk signal to alert drivers to their presence. Beg buttons – so called because they require pedestrians to press them in order to receive a walk signal rather than providing one automatically with a green light - make it more walking more complicated and inconvenient. Create pedestrian refuges in the median so that people crossing large intersections with complicated traffic patterns have a backup option if they can’t make it across all the lanes of traffic. Improve signage so that drivers are more aware that pedestrians will be crossing the street and so that pedestrians know the safer places to cross. Wayfinding signs could be invaluable in directing people to cross where it’s safest. Featured image: Dylan Passmore on Flickr. These more complicated but doable projects may take a little time and money, but are within reach if we get started now. Also called ‘hot rights’, these dedicated right hand turn lanes allow cars to make right turns at any time without stopping. Old Georgetown and Rockville Pike, Nicholson and Rockville Pike, and Tuckerman and Rockville Pike all have hot rights. For pedestrians, slip lanes make intersections less safe by placing walkers directly in the path of fast-moving cars and increasing the distance they must travel to cross the road. Mid-block crossings are dedicated pedestrian crosswalks between signalized intersections on very long blocks. A crosswalk at Executive Boulevard and Rockville Pike by North Bethesda Market is just one place where a mid-block crosswalk would help. Several areas of high-pedestrian traffic in the Pike District lack formal sidewalks, and instead have only well-worn dirt paths, known as ‘desire paths’, that develop from foot traffic. Where there are desire paths, there should be real, paved sidewalks. All images this section: Dan Reed on Flickr. These more complicated but doable projects may take a little time and money, but are within reach if we get started now. These longer-term solutions should be integrated into the continuing transformation of the Pike District. Route 355 has narrower lanes and slower speeds when it passes through Bethesda. Doing the same in the Pike District would help make the road safer for everybody. Improving sidewalks along Rockville Pike and other busy roads in the Pike District – by making them wider, separated from traffic, and attractive – will help make the area a more desirable and safer place to walk.